"Vicious Circles" - Bright red jelly base, several sizes of silver holographic circles, and super small silver bar glitters. I used 3 coats, but it could be opaque with two thicker coats! Love love love! You know how much I love my giant, holographic circle glitters! "Excuse Me, I Blurpled" - This "blurple" jelly (part blue, part purple) shade is fittingly named (I adore Christy's pun-filled names) and contains pink, blue, purple, and a tiny bit of copper hexes. For as dark as the base is, it wasn't the most opaque. However, adding more coats actually adds a lot of depth to this! I used 3 coats here. 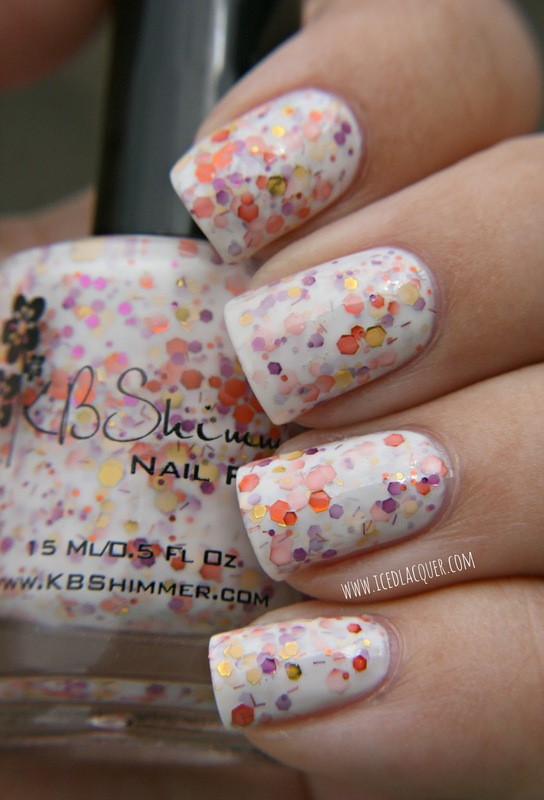 "You Autumn Know" - A white based polish with gold, orange, and magenta hexes, as well as some more of those teeny tiny bar glitters. The white was just a touch too opaque and it covered up a lot of glitter, but I still really like it! Totally reminds me of autumn leaves. Again, I used 3 coats here. "You Go Ghoul" - A deep black jelly with orange, pink, and purple hexes and micro bars. From a distance, this can come off very dark, but once the glitters catch the light it absolutely glows. This is probably one of my favorite shades and I can't wait to wear it for Halloween! I believe I used 3 coats for this one as well. "Every Nook & Cranberry" - A bright cranberry base loaded with pink, purple, and gold shimmery flakes. This one dries to a matte finish, but I love that you can still see the shimmer. Again, 3 coats here. 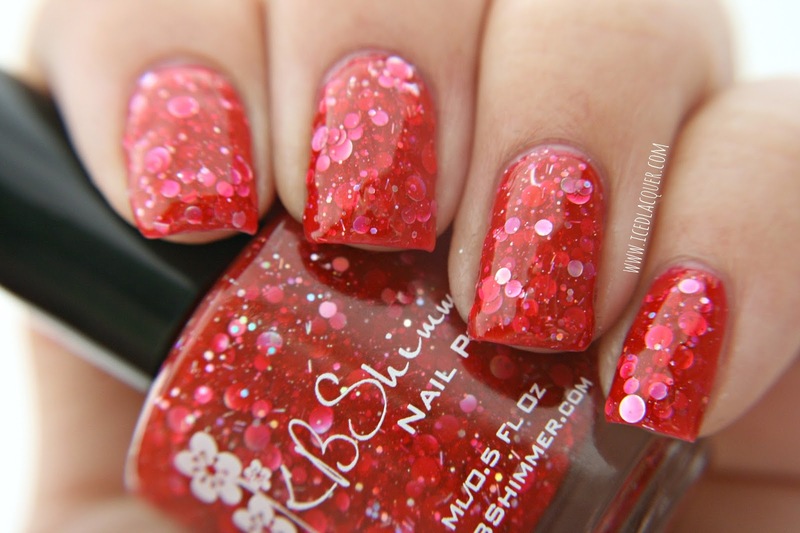 This is a really great way to wear a red polish with that extra bit of something special. As beautiful as it is matte, I generally prefer to wear my polishes shiny so here it is with some top coat! Adding the top coat really brings out the glowy shimmer. "Turbulence" - A deep gray base filled with pink, blue, gold, and silver flakes, which also dries to a matte finish. This one seemed to contain some larger flakes than the ones in "Every Nook & Cranberry." Again, 3 coats gave me excellent coverage. For this shade, I think I actually prefer it matte! It looks great shiny too, but I think this shade of slate really looks great in the matte finish. "Teal Another Tail" - Another favorite for me! This lovely shade of teal is simply stunning! It's almost like the entire polish is made of large, duochrome flakes mixed with some tiny blue and (I think) purple hexes. The pink shift is very strong and totally comes alive in sunlight! It doesn't dry quite to a matte like the others, but the flakes do create somewhat of a satin finish. I felt satisfied leaving this one at 2 coats. Well, what do you think? Which ones are your favorite? These seven exciting new shades will be available for sale starting on September 1st at http://kbshimmer.com/. And if you've been eyeing some of the polishes from the existing collections, you can score free shipping on orders over $15 through August 21st!